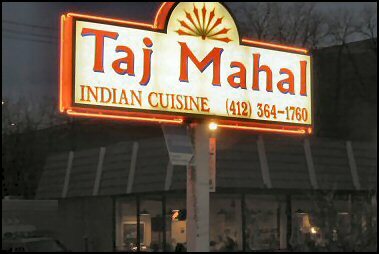 Bliss was it in that dawn to be alive, But to be hungry at Taj Mahal in Pittsburgh was very heaven (thank you, Wordsworth). We swear that in several decades of eating out we've never tasted Tandoori Chicken this good. Perhaps, we were in luck. Our friendly waiter Ranjit (a Gannon University student) mentioned that credit for the succulent Tandoori Chicken should go to the restaurant's new chef Chotu. The secret of Taj Mahal's Tandoori Chicken, we think, lies in its marination with the right mix of ginger, garlic, spices, red chili powder and salt. Most Indian restaurants in the U.S. fling the Chicken into the Tandoor oven, take it out and speed it to our tables after daubing some red color on the Chicken. Predictably, it ends up tasteless. It takes a Taj Mahal to serve Tandoori Chicken this grand. Besides Taj Mahal's impressive Tandoori Chicken, we were delighted with the restaurant's Chicken Makhani. It was creamy and delicious and we lapped it up with both rice and Naan bread. But the Chicken Curry did not send us into raptures. You see, we'd been spoiled after the first bite into Taj Mahal's Tandoori Chicken and our expectations rose higher from this restaurant. Taj Mahal is not a dining Mecca merely for the carnivores. Vegetarians will relish its Spicy Channa Masala and the well cooked Alu Gobi Mutter. We had a hard time deciding whether to opt for a second helping of Mixed Vegetable Korma, Kadai Saag or Dal Banjara. Our problem was that they were all equally good. Ultimately, we opted for Kadai Saag with a tinge of regret at having to make a choice. After all, there's only so much food that even gluttons like us can eat! Naan bread was light and tasted nice. We also dug into a collection of desserts including such staples as Rice Kheer and Gulab Jamun as well as Mango Custard and a Barfi. Gulab Jamun was warm and tasted yummy while the Rice Kheer was delicious. Barfi was below average while the Mango Custard was average. We topped off our meal with a glass of refreshing Jal Jeera (a tamarind drink with cumin, black salt and black peppers, garnished with mint leaves) and a cup of Masala Tea, a fitting finale to a fine lunch. While Taj Mahal's menu leans heavily towards the North Indian side, its menu also lists a few South Indian favorites such as Idli, Dosa, Medhu Vadu and Uttapam. Although it was a rainy day in Pittsburgh, Taj Mahal had a fairly decent lunch crowd. For food this good, people will and should brave even Katrina weather.